Meller optical domes are fabricated from sapphire, quartz, glass, silicon and germanium in sizes up to 100mm diameter with included angles to 160 degrees and dimensional tolerances to +/-10 microns. Manufactured on a highly repeatable 5-axis spherical machining center, they exhibit less than 25 microns wall thickness variation. 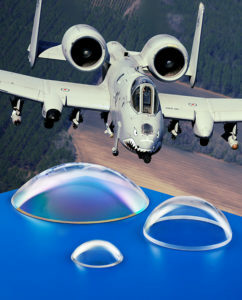 Featuring surface accuracy to less than 1 fringe measured at 633nm and finishes to 20-10 scratch-dig per MIL-PRF-13830, Meller optical domes are well suited for a wide variety of applications including high speed missile domes, viewports, and other front surface optics requirements. Optical Domes are priced according to material, size, part, geometry and quantity. Wall Thickness: Preferred 20:1 aspect ratio diameter to thickness. Less than 25 microns wall thickness variation within an overall thickness tolerance of +/- .05mm. Spherical Irregularity: Less than 2 fringes per inch, measured at 632 nanometers. Surface Finish: 80-50 to 20-10 per MIL-PRF-13830 dependent upon surface irregularity. Quantity discounts are available. Sapphire Domes are typically fabricated to customer specifications. For more information, or to request a quote please Contact Us.